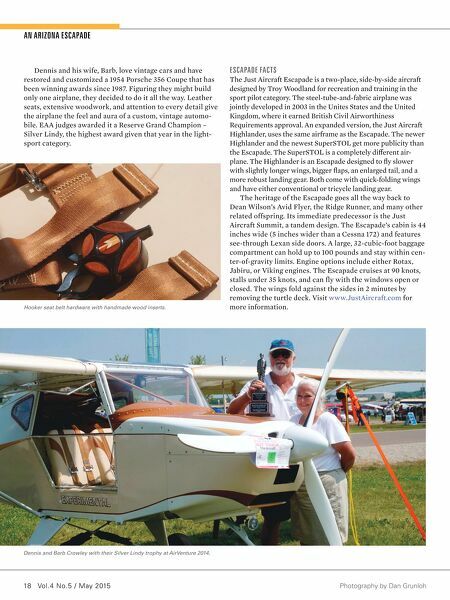 EAA Experimenter 19 THE BUIL D The decision to build an airplane in your garage, especially your first airplane, is no small step to take at the age of 63 years. Dennis Crowley always wanted to fly, but eyesight and other factors kept him on the ground until 2006 when he earned a sport pilot certificate. Traveling to fly or rent an air- plane was never a good option, so Dennis reserved the N-number N356AZ for a light-sport aircraft he had not yet chosen at the time. It was to honor his much loved Porsche 356. Dennis and Barb are both retired educators. Dennis had a lifetime of experience teaching mostly fifth- and sixth-grade elementary school kids. Surely that would strengthen and build one's sense of patience, determination, and dedication. After studying all the options, he decided on the Escapade partly because of the style of the rounded tail feathers as compared to the Highlander. He purchased an early quick- build kit, No. 17, secondhand for a bargain price. 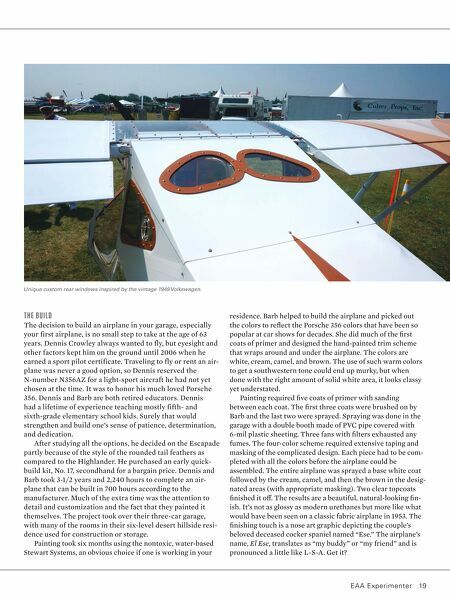 Dennis and Barb took 3-1/2 years and 2,240 hours to complete an air- plane that can be built in 700 hours according to the manufacturer. Much of the extra time was the attention to detail and customization and the fact that they painted it themselves. The project took over their three-car garage, with many of the rooms in their six-level desert hillside resi- dence used for construction or storage. Painting took six months using the nontoxic, water-based Stewart Systems, an obvious choice if one is working in your residence. Barb helped to build the airplane and picked out the colors to refl ect the Porsche 356 colors that have been so popular at car shows for decades. She did much of the fi rst coats of primer and designed the hand-painted trim scheme that wraps around and under the airplane. The colors are white, cream, camel, and brown. The use of such warm colors to get a southwestern tone could end up murky, but when done with the right amount of solid white area, it looks classy yet understated. Painting required fi ve coats of primer with sanding between each coat. The fi rst three coats were brushed on by Barb and the last two were sprayed. Spraying was done in the garage with a double booth made of PVC pipe covered with 6-mil plastic sheeting. Three fans with fi lters exhausted any fumes. The four-color scheme required extensive taping and masking of the complicated design. Each piece had to be com- pleted with all the colors before the airplane could be assembled. The entire airplane was sprayed a base white coat followed by the cream, camel, and then the brown in the desig- nated areas (with appropriate masking). Two clear topcoats fi nished it of . The results are a beautiful, natural-looking fi n- ish. It's not as glossy as modern urethanes but more like what would have been seen on a classic fabric airplane in 1953. The fi nishing touch is a nose art graphic depicting the couple's beloved deceased cocker spaniel named "Ese." The airplane's name, El Ese, translates as "my buddy" or "my friend" and is pronounced a little like L-S-A. Get it? Unique custom rear windows inspired by the vintage 1949 Volkswagen.